The historicity of Jesus concerns not just the issue of "what really happened," based upon the context of the time and place, but also the issue of how modern observers can come to know "what really happened." A second issue is closely tied to historical research practices and methodologies for analyzing the reliability of primary sources and other historical evidence. The historicity of Jesus concerns the degree to which sources show Jesus of Nazareth existed as a historical figure or whether, perhaps he was a Nazirite. The historicity of Jesus is distinct from the related study of the historical Jesus, which refers to scholarly reconstructions of the life of Jesus, based primarily on critical analysis of the gospel texts. Historicity, by contrast as a subject of study different from history proper is concerned with two different fundamental issues. Firstly it is concerned with the systemic processes of social change, and secondly what was the social context and intentions of the authors of the sources by which we can establish the truth of historical events, separating mythic accounts from factual circumstances. Non-Christian sources which are used to study and establish the historicity of Jesus include Jewish sources such as Josephus, and Roman sources such as Tacitus. The sources are compared to Christian sources such as the Pauline Letters and the Synoptic Gospels, and are usually independent of each other (e.g. Jewish sources do not draw upon Roman sources), and similarities and differences between them are used in the authentication process. Josephus' Antiquities of the Jews, written around 93–94 AD, includes two references to the biblical Jesus in Books 18 and 20. The general scholarly view is that while the longer passage, known as the Testimonium Flavianum, is most likely not authentic in its entirety, it is broadly agreed upon that it originally consisted of an authentic nucleus, which was then subject to Christian interpolation or forgery. Of the other mention in Josephus, Josephus scholar Louis H. Feldman has stated that "few have doubted the genuineness" of Josephus' reference to Jesus in Antiquities 20, 9, 1 and it is only disputed by a small number of scholars. There is a total of three references to the name 'Jesus' in Book 20, Chapter 9: "Jesus, who was called Christ" (i.e. ' Messiah'); "Jesus, son of Damneus", a Jewish High Priest (both in Paragraph 1); and "Jesus, son of Gamaliel", another Jewish High Priest (in Paragraph 4). Roman historian Tacitus referred to 'Christus' and his execution by Pontius Pilate in his Annals (written ca. AD 116), book 15, chapter 44. The very negative tone of Tacitus' comments on Christians make the passage extremely unlikely to have been forged by a Christian scribe. The Tacitus reference is now widely accepted as an independent confirmation of Christ's crucifixion, although some scholars question the authenticity of the passage on various different grounds. The historical reliability of the Gospels refers to the reliability and historic character of the four New Testament gospels as historical documents. 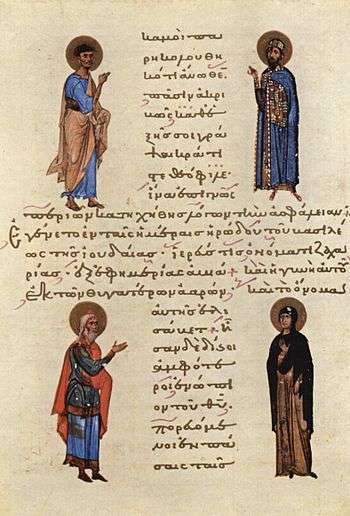 Some scholars state that the authorship of the gospels is pseudepigraphic and unknown and little in the four canonical gospels is considered to be historically reliable. Most scholars of antiquity agree that Jesus existed, but scholars differ on the historicity of specific episodes described in the biblical accounts of Jesus. 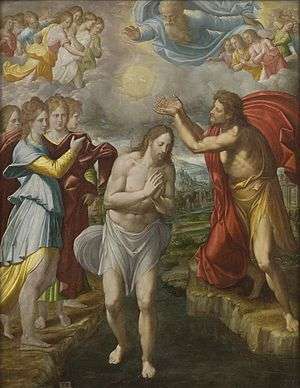 :181 The only two events subject to "almost universal assent" are that Jesus was baptized by John the Baptist and between one to three years later that he was crucified by the order of the Roman Prefect Pontius Pilate. 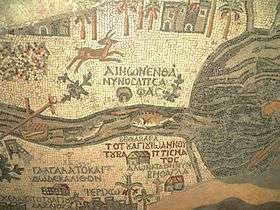 Elements whose historical authenticity is disputed include the two accounts of the Nativity of Jesus, the miraculous events including turning water into wine, walking on water and the resurrection, and certain details about the crucifixion. The Synoptic Gospels are the primary sources of historical information about Jesus and of the religious movement he founded. These religious gospels—the Gospel of Matthew, the Gospel of Mark, and the Gospel of Luke—written in the Greek language, recount the life, ministry, crucifixion and resurrection of a Jew named Jesus, who spoke Aramaic. There are different hypotheses regarding the origin of the texts because the gospels of the New Testament were written in Greek for Greek-speaking communities, that were later translated into Syriac, Latin, and Coptic although some say a version of the Gospel of Matthew may have been composed in Aramaic. The fourth gospel, the Gospel of John, differs greatly from the first three gospels. Historians often study the historical reliability of the Acts of the Apostles when studying the reliability of the gospels, as the Book of Acts was seemingly written by the same author as the Gospel of Luke. Historians subject the gospels to critical analysis by differentiating authentic, reliable information from possible inventions, exaggerations, and alterations. Since there are more textual variants in the New Testament (200–400 thousand) than it has letters (c. 140 thousand), scholars use textual criticism to determine which gospel variants could theoretically be taken as 'original'. To answer this question, scholars have to ask who wrote the gospels, when they wrote them, what was their objective in writing them, what sources the authors used, how reliable these sources were, and how far removed in time the sources were from the stories they narrate, or if they were altered later. Scholars can also look into the internal evidence of the documents, to see if, for example, the document is misquoting texts from the Hebrew Tanakh, is making claims about geography that were incorrect, if the author appears to be hiding information, or if the author has made up a certain prophecy. Finally, scholars turn to external sources, including the testimony of early church leaders, writers outside the church (mainly Jewish and Greco-Roman historians) who would have been more likely to have criticized the church, and to archaeological evidence. Scholarly agreement on this extended list is not universal. The Mishnah (c. 200) may refer to Jesus and reflect the early Jewish traditions of portraying Jesus as a sorcerer or magician. Other references to Jesus and his execution exist in the Talmud, but they aim to discredit his actions, not deny his existence. Since the 18th century, three separate scholarly quests for the historical Jesus have taken place, each with distinct characteristics and based on different research criteria, which were often developed during that phase. The portraits of Jesus that have been constructed in these processes have often differed from each other, and from the dogmatic image portrayed in the gospel accounts. In the 21st century, the third quest for the historical Jesus witnessed a fragmentation of the scholarly portraits of Jesus. Currently modern scholarly research on the historical Jesus focuses on what is historically probable, or plausible about Jesus. The mainstream profiles in the third quest may be grouped together based on their primary theme as apocalyptic prophet, charismatic healer, Cynic philosopher, Jewish Messiah and prophet of social change, but there is little scholarly agreement on a single portrait, or the methods needed to construct it. There are, however, overlapping attributes among the portraits, and scholars who differ on some attributes may agree on others. Nearly all modern scholars of antiquity, which is the majority viewpoint, agree that Jesus existed and most biblical scholars and classical historians see the theories of his non-existence as effectively refuted. [nb 9] There is no evidence today that the existence of Jesus was ever denied in antiquity by those who opposed Christianity. Geoffrey Blainey notes that "a few scholars argue that Jesus... did not even exist," and that they "rightly point out that contemporary references to him were extremely rare." Bart Ehrman concedes, "Jesus is not mentioned in any Roman sources of his day", while maintaining that other sources do support his existence whereas Richard Carrier and Raphael Lataster assert that there is no independent evidence of Jesus’s existence outside the New Testament. Certain scholars, particularly in Europe, have recently made the claim that while there are a number of plausible Jesuses that could have existed, there can be no certainty as to which Jesus was the biblical Jesus, and that there should also be more scholarly research and debate on this topic. 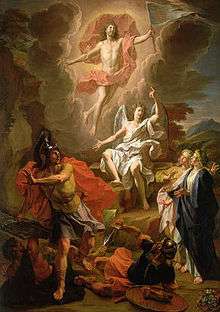 The Resurrection of Christ by Noel Coypel (1700)—Some myth theorists see this as a case of a dying-and-rising god. The Christ myth theory is the proposition that Jesus never existed, or that if he did, he had virtually nothing to do with the founding of Christianity and the accounts in the gospels. This theory has very little support among current scholars. Historically however, mythicist viewpoints were noted to varying degrees within academia and some even became part of the mainstream scholarship, such as the viewpoint of David Strauss. The theory enjoyed brief popularity in the Soviet Union, where it was supported by Sergey Kovalev, Alexander Kazhdan, Abram Ranovich, Nikolai Rumyantsev, Robert Wipper and Yuri Frantsev. Later, however, several scholars, including Kazhdan, had retracted their views about mythical Jesus and by the end of the 1980s the support for the theory became almost non-existent in Soviet academia. More recently Richard Carrier argues in his book On the Historicity of Jesus: Why We Might Have Reason for Doubt, that there is insufficient Bayesian probability, that is evidence, to believe in the existence of Jesus. Furthermore, he argues that the Jesus figure was probably originally known only through private revelations and hidden messages in scripture which were then crafted into a historical figure, to communicate the claims of the gospels allegorically. These allegories then started to be believed as fact during the struggle for control of the Christian churches of the 1st century. Philip R. Davies has opined that a recognition that the historicity of Jesus is not entirely certain would nudge Jesus scholarship towards academic respectability and R. Joseph Hoffmann at the Jesus Project noted that Jesus is getting more vague, ambiguous, and uncertain the more scholars study him, rather than the other way around. Other than Carrier, notable experts who have published peer reviewed books on the historicity of Jesus using the most current scholarship available on the subject include: Dale Allison, Bart Ehrman, Amy-Jill Levine and Geza Vermes, all of whom believe that the historical Jesus existed and oppose the Christ Myth Theory, but who tend to see the historical Jesus as a Jewish preacher who never claimed to be God nor had any intention to found a religion. However some authors disagree with this consensus. ↑ While discussing the "striking" fact that "we don't have any Roman records, of any kind, that attest to the existence of Jesus," Ehrman dismisses claims that this means Jesus never existed, saying, "He certainly existed, as virtually every competent scholar of antiquity, Christian or non-Christian, agrees, based on clear and certain evidence." ↑ Robert M. Price, a former fundamentalist apologist turned atheist who says the existence of Jesus cannot be ruled out, but is less probable than non-existence, agrees that his perspective runs against the views of the majority of scholars. ↑ Michael Grant (a classicist) states that "In recent years, 'no serious scholar has ventured to postulate the non historicity of Jesus' or at any rate very few, and they have not succeeded in disposing of the much stronger, indeed very abundant, evidence to the contrary." ↑ "There are those who argue that Jesus is a figment of the Church’s imagination, that there never was a Jesus at all. I have to say that I do not know any respectable critical scholar who says that any more." ↑ Of "baptism and crucifixion", these "two facts in the life of Jesus command almost universal assent". ↑ "That he was crucified is as sure as anything historical can ever be, since both Josephus and Tacitus ... agree with the Christian accounts on at least that basic fact." ↑ ..."The point I shall argue below is that, the agreed evidentiary practices of the historians of Yeshua, despite their best efforts, have not been those of sound historical practice". ↑ "[F]arfetched theories that Jesus' existence was a Christian invention are highly implausible." ↑ Robert E. Van Voorst, referring to G.A. Wells: "The nonhistoricity thesis has always been controversial, and it has consistently failed to convince scholars of many disciplines and religious creeds... Biblical scholars and classical historians now regard it as effectively refuted". ↑ Blomberg, Craig L. (2007). The Historical Reliability of the Gospels. InterVarsity Press. ISBN 9780830828074. ↑ Carrier, Richard Lane (2014). On the Historicity of Jesus: Why we might Have Reason for Doubt. Sheffield Phoenix Press. ISBN 9781909697355. ↑ Dickson, John. "Best of 2012: The irreligious assault on the historicity of Jesus". Abc.net.au. Retrieved 17 June 2014. ↑ Bart D. Ehrman (22 March 2011). Forged: Writing in the Name of God--Why the Bible's Authors Are Not Who We Think They Are. HarperCollins. p. 285. ISBN 978-0-06-207863-6. ↑ James Douglas Grant Dunn (1 February 2010). The Historical Jesus: Five Views. SPCK Publishing. p. 61. ISBN 978-0-281-06329-1. ↑ Michael Grant (January 2004). Jesus. Orion. p. 200. ISBN 978-1-898799-88-7. ↑ Richard A. Burridge; Graham Gould (2004). Jesus Now and Then. William B. Eerdmans Publishing Company. p. 34. ISBN 978-0-8028-0977-3. ↑ James D. G. Dunn (2003). Jesus Remembered. Wm. B. Eerdmans Publishing. p. 339. ISBN 978-0-8028-3931-2. ↑ John Dominic Crossan (1994). Jesus: A Revolutionary Biography. HarperCollins. p. 45. ISBN 978-0-06-061662-5. 1 2 3 4 5 Mark Allan Powell (1998). Jesus as a Figure in History: How Modern Historians View the Man from Galilee. Westminster John Knox Press. ISBN 978-0-664-25703-3. ↑ Donald H. Akenson (29 September 2001). Surpassing Wonder: The Invention of the Bible and the Talmuds. University of Chicago Press. ISBN 978-0-226-01073-1. 1 2 Robert E. Van Voorst (2000). Jesus Outside the New Testament: An Introduction to the Ancient Evidence. Wm. B. Eerdmans Publishing. ISBN 978-0-8028-4368-5. ↑ Markus Bockmuehl (8 November 2001). The Cambridge Companion to Jesus. Cambridge University Press. pp. 123–124. ISBN 978-0-521-79678-1. ↑ James L. Houlden (2003). Jesus in History, Thought, and Culture: Entries A - J. ABC-CLIO. ISBN 978-1-57607-856-3. ↑ Robert E. Van Voorst (2000). Jesus Outside the New Testament: An Introduction to the Ancient Evidence. Wm. B. Eerdmans Publishing. p. 14. ISBN 978-0-8028-4368-5. ↑ Amy-Jill Levine; Dale C. Allison Jr.; John Dominic Crossan (16 October 2006). The Historical Jesus in Context. Princeton University Press. pp. 1–2. ISBN 0-691-00992-9. ↑ Bart D. Ehrman (1999). Jesus: Apocalyptic Prophet of the New Millennium. Oxford University Press. pp. ix–xi. ISBN 978-0-19-512473-6. ↑ James D. G. Dunn (2003). Jesus Remembered. Wm. B. Eerdmans Publishing. pp. 125–127. ISBN 978-0-8028-3931-2. ↑ Theissen, Gerd; Merz, Annette (1996). The Historical Jesus. Minneapolis MN: Fortress Press. pp. 17–62. ISBN 978-0-8006-3122-2. ↑ Bruce David Chilton; Craig Alan Evans (1998). Studying the Historical Jesus: Evaluations of the State of Current Research. BRILL. pp. 460–470. ISBN 90-04-11142-5. ↑ Schreckenberg, Heinz; Kurt Schubert (1992). Jewish Traditions in Early Christian Literature. ISBN 90-232-2653-4. ↑ Kostenberger, Andreas J.; L. Scott Kellum; Charles L. Quarles (2009). The Cradle, the Cross, and the Crown: An Introduction to the New Testament. ISBN 0-8054-4365-7. ↑ Martin, Michael. The Case Against Christianity. pp. 50–51. ↑ Charles H. Talbert, What Is a Gospel? The Genre of Canonical Gospels pg 42 (Philadelphia: Fortress Press, 1977). ↑ “The Historical Figure of Jesus," Sanders, E.P., Penguin Books: London, 1995, p. 3. 1 2 3 4 Jesus Remembered by James D. G. Dunn 2003 ISBN 0-8028-3931-2 p. 339 states of baptism and crucifixion that these "two facts in the life of Jesus command almost universal assent". 1 2 Crossan, John Dominic (1995). Jesus: A Revolutionary Biography. HarperOne. p. 145. ISBN 0-06-061662-8. That he was crucified is as sure as anything historical can ever be, since both Josephus and Tacitus ... agree with the Christian accounts on at least that basic fact. ↑ James G. D. Dunn, Jesus Remembered, (Eerdmans, 2003) pp. 779–781. ↑ Funk, Robert W. and the Jesus Seminar. The acts of Jesus: the search for the authentic deeds of Jesus. HarperSanFrancisco. 1998. "Empty Tomb, Appearances & Ascension" pp. 449–495. ↑ "The Synoptic Gospels, then, are the primary sources for knowledge of the historical Jesus" "Jesus Christ." Encyclopædia Britannica. 2010. Encyclopædia Britannica Online. 27 November 2010 . ↑ Bart D. Ehrman: Misquoting Jesus – The Story Behind Who Changed the Bible and Why, p. 90 (review). ↑ Paul Rhodes Eddy & Gregory A. Boyd, The Jesus Legend:A Case for the Historical Reliability of the Synoptic Jesus Tradition. (2008, Baker Academic).309-262. ↑ The Gospel of Matthew claims, the title Nazarene for Jesus was derived from the prophecy "He will be called a Nazorean" (Matthew 2:22–23), despite the lack of any Old Testament source. 1 2 Amy-Jill Levine; Dale C. Allison Jr.; John Dominic Crossan (16 October 2006). The Historical Jesus in Context. Princeton University Press. p. 4. ISBN 0-691-00992-9. ↑ Eisenmann, Robert, (2001), "James the Brother of Jesus: The Key to Unlocking the Secrets of Early Christianity and the Dead Sea Scrolls"
↑ John P. Meier "Criteria: How do we decide what comes from Jesus?" in The Historical Jesus in Recent Research by James D. G. Dunn and Scot McKnight (15 Jul 2006) ISBN 1575061007 p. 124 "Since in the quest for the historical Jesus almost anything is possible, the function of the criteria is to pass from the merely possible to the really probable, to inspect various probabilities, and to decide which candidate is most probable. Ordinarily the criteria can not hope to do more." ↑ Amy-Jill Levine in the The Historical Jesus in Context edited by Amy-Jill Levine et al. 2006 Princeton University Press ISBN 978-0-691-00992-6 p. 1: "no single picture of Jesus has convinced all, or even most scholars"
↑ James D. G. Dunn (1974) Paul's understanding of the death of Jesus in Reconciliation and Hope. New Testament Essays on Atonement and Eschatology Presented to L.L. Morris on his 60th Birthday. Robert Banks, ed., Carlisle: The Paternoster Press, pp. 125–141, Citing G.A. Wells (The Jesus of the Early Christians (1971)): "Perhaps we should also mention that at the other end of the spectrum Paul’s apparent lack of knowledge of the historical Jesus has been made the major plank in an attempt to revive the nevertheless thoroughly dead thesis that the Jesus of the Gospels was a mythical figure." An almost identical quotation is included in Dunn, James DG (1998) The Christ and the Spirit: Collected Essays of James D.G. Dunn, Volume 1, Wm. B. Eerdmans Pub. Co., p. 191, and Sykes, S. (1991) Sacrifice and redemption: Durham essays in theology. Cambridge [England]: Cambridge University Press. pp. 35-36. ↑ Encyclopedia of theology: a concise Sacramentum mundi by Karl Rahner 2004 ISBN 0-86012-006-6 pp. 730–731: "The few non-Christian sources [e.g. Tacitus, Suetonius, Pliny the Younger, and Josephus] merely confirm that in antiquity it never occurred to any one, even the bitterest enemies of Christianity, to doubt the existence of Jesus"
↑ Ehrman, Bart D. (March 20, 2012). "Did Jesus Exist?". Huffpost Religion. The Huffington Post. ↑ Lataster, Raphael (November 12, 2015). "Afterword by Richard Carrier". Jesus Did Not Exist: A Debate Among Atheists. p. 418. ISBN 1514814420. [T]here is no independent evidence of Jesus’s existence outside the New Testament. All external evidence for his existence, even if it were fully authentic (though much of it isn’t), cannot be shown to be independent of the Gospels, or Christian informants relying on the Gospels. None of it can be shown to independently corroborate the Gospels as to the historicity of Jesus. Not one single item of evidence. Regardless of why no independent evidence survives (it does not matter the reason), no such evidence survives. ↑ Lataster, Raphael (December 14, 2014). "Weighing up the evidence for the 'Historical Jesus'". The Conversation. The Conversation (website). There are no existing eyewitness or contemporary accounts of Jesus. All we have are later descriptions of Jesus’ life events by non-eyewitnesses, most of whom are obviously biased. ↑ Thomas L. Thompson; Thomas S. Verenna (2013). 'Is This Not the Carpenter? ': The Question of the Historicity of the Figure of Jesus. Acumen Publishing, Limited. ISBN 978-1-84465-729-2. ↑ Bart Ehrman, Did Jesus Exist? Harper Collins, 2012, p. 12, describes the "Jesus mythicism" view as follows: "In simpler terms, the historical Jesus did not exist. Or if he did, he had virtually nothing to do with the founding of Christianity." Ehrman further quotes the fuller definition provided by Earl Doherty in Jesus: Neither God Nor Man. Age of Reason, 2009, pp. vii–viii: it is "'the theory that no historical Jesus worthy of the name existed, that Christianity began with a belief in a spiritual, mythical figure, that the Gospels are essentially allegory and fiction, and that no single identifiable person lay at the root of the Galilean preaching tradition.'" 1 2 Carrier, Richard (2014). On the Historicity of Jesus: Why We Might Have Reason for Doubt. Sheffield Phoenix Press Limited. p. 52. ISBN 978-1-909697-49-2. [T]he basic thesis of every competent mythologist, then and now, has always been that Jesus was originally a god just like any other god (properly speaking, a demigod in pagan terms; an archangel in Jewish terms; in either sense, a deity), who was later historicized. ↑ Schweitzer, Albert (7 October 2014). Out of My Life and Thought: An Autobiography. Henry Holt and Company. p. 133. ISBN 978-1-4668-8294-2. In the autumn of 1912, when l was already busy shopping and packing for Lambaréné, I undertook to integrate into The Quest of the Historical Jesus material from the new books that had in the meantime appeared on the subject and to rewrite sections that no longer satisfied me. I especially wanted to explain late Jewish eschatology more thoroughly and to discuss the works of John M. Robertson, William Benjamin Smith, James George Frazer, Arthur Drews, and others, who contested the historical existence of Jesus. ↑ Wood, Herbert George (1934). Christianity and the nature of history. University Press. p. 40. [T]he sociological fashion reflected in the rise of Formgeschichte lends colour to Christ-myth theories and indeed to all theories which regard Jesus as an historical but insignificant figure. ↑ A. C. COTTER, S.J. "ALFRED LOISY (1857-1940)". Theological Studies: A brief survey of Loisy's life and work (PDF). America Press. [Loisy] came out with a vigorous attack on Couchoud's mythical theory in Histoire et mythe à propos de Jésus-Christ (1938). To Loisy's credit be it said that, to the end of his days, he maintained Jesus' historical existence against all mythmakers. ↑ Holding, James Patrick (June 2008). Shattering the Christ Myth. Xulon Press. p. 16. ISBN 978-1-60647-271-2. On George Albert Wells: "For his first book The Jesus of the Early Christians (1971), Wells took advantage of his fluency in German to read the radical work of Drews, Bauer and others. He had access to all the books that had never been translated into English. The result was a restatement of the early-twentieth century argument that used pagan parallels and interpolation as its main planks. The book was released by a trade publisher and received critical reviews in some academic journals. None of his later works received the same sort of attention." ↑ Beilby, James K.; Eddy, Paul Rhodes (4 January 2010). The Historical Jesus: Five Views. InterVarsity Press. p. 15. ISBN 978-0-8308-7853-6. One of the most influential figures of the “old” quest is David Friedrich Strauss (1808-1874). His book The Life of Jesus Critically Examined, originally published in 1835, became one of the most controversial studies of Jesus ever written. ↑ А. В. Андреев (2015). "Дискуссия об историчности Иисуса Христа в советском религиоведении" (PDF). Вестник ПСТГУ (in Russian). Retrieved 12 June 2015. ↑ Гололоб Г. "Богословие и национальный вопрос" (in Russian). Библиотека Гумер. Retrieved 12 June 2015. ↑ Carrier, Richard (January 10, 2009). "Amherst Conference". Richard Carrier Blogs. ↑ Dr. Richard Carrier. "Questioning the Historicity of Jesus". Strange Notions. Brandon Vogt. Retrieved 6 April 2016. The hypothesis that Jesus never really existed has started to gain more credibility in the expert community. Some now agree historicity agnosticism is warranted, including Arthur Droge (professor of early Christianity at UCSD), Kurt Noll (associate professor of religion at Brandon University), and Thomas Thompson (renowned professor of theology, emeritus, at the University of Copenhagen). Others are even more certain historicity is doubtful, including Thomas Brodie (director emeritus of the Dominican Biblical Centre at the University of Limerick, Ireland), Robert Price (who has two Ph.D.’s from Drew University, in theology and New Testament studies), and myself (I have a Ph.D. in ancient history from Columbia University and have several peer reviewed articles on the subject). Still others, like Philip Davies (professor of biblical studies, emeritus, at the University of Sheffield), disagree with the hypothesis but admit it is respectable enough to deserve consideration. Brown, Raymond E. (1997). An Introduction to the New Testament. Doubleday.